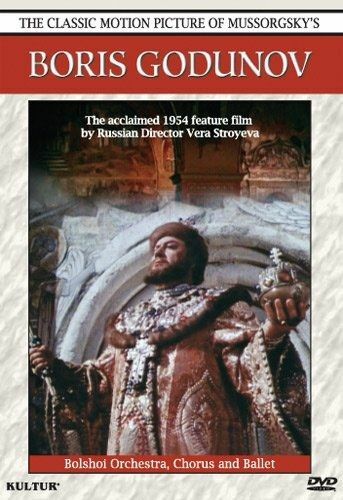 quote from Amazon user: A complement I say, as this not being complete (well, I’d better say severely truncated) it cannot be your sole Boris in a collection; necessary I add, because it preserved a sizable portion of the title part, as portrayed by one of its foremost exponents ever, the great russian bass Alexander Pirogov. This incompleteness is only implied but not clearly stated in the disc’s box, which should advise would-be purchasers. So what you get is some kind of “extended highlights” of this, arguably the greatest of russian operas and certainly the most popular. 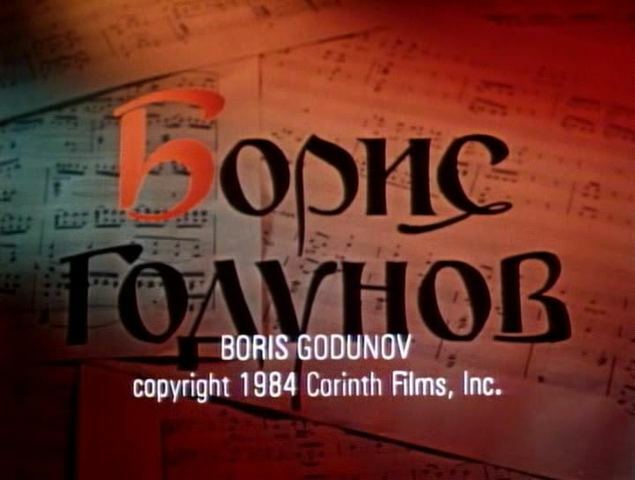 It is a film by Vera Stroieva, made in 1954 as part of a project dear to soviet authorities of putting into film both the lives of Russia’s greatest artists and adaptations of their works, to “educate the masses” and of course not being entirely without some ideological hints (or rather more than mere hints). 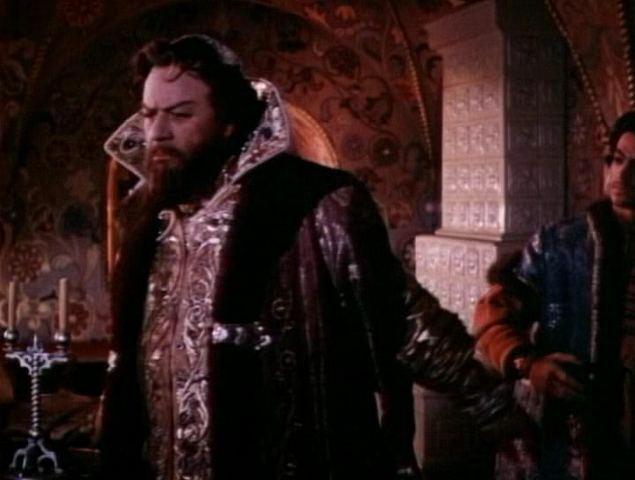 Stroieva made effective use of exterior shots, as well as mixes of “theatrical stage” sequences with other ones filmed inside the Kremlin, which gave the film an intriguing aura and allowed us to look at Boris Godunov from an unusual perspective; the soundtrack was dubbed and lip sinchronised of course, but remarkably well, with results far better than those in contemporary efforts by RAI to film standard italian operas. 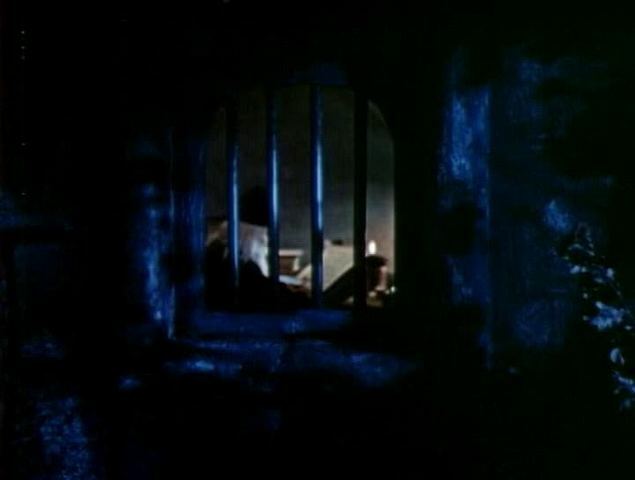 From the film perspective, it followed the traditions of soviet film making, with stunning images, stark closeups and vast shots of hundreds of extras in the opera scenes involving the people; the soudtrack had to be made on purpose for the project, as the myriad cuts in the score ruled out cutting and splicing existing recordings. 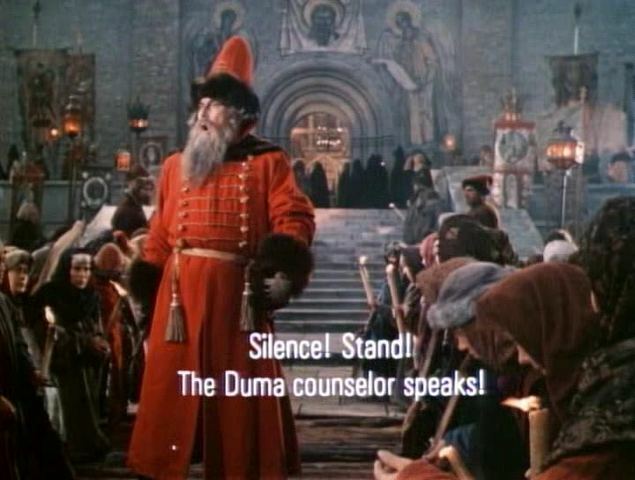 Stroieva also made a startling use of the Kromy revolt scene: she cut it rather abruptly at the point when the jesuits from the Pretender’s army enter and swiftly switched to the Kremlin quarters where the Duma has met, to proceed with Boris’s entrace and death scene; after Boris’s death she goes back to Kromy but not in a straight “continuation” of what she had left but to a panorama of violence and destruction by war. Then, after the speech by the Pretender the retinue proceeds its victorious march towards Moscow to the rather perplexed and disillusioned expressions of the onlookers faces, the Simpleton utters his final comments that were Mussorgski’s original ending for the opera (and Stroieva’s film). The film as a whole certainly makes for stirring viewing and has been very well preserved and restored, with colours that have not faded nor acquired that curious tint so typical of decades-old pictures; VAI’s dvd adaptation is very good.